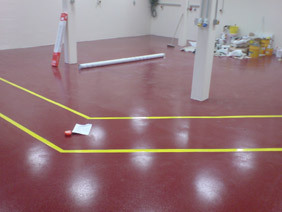 Resin flooring has to have a number of different properties that vary in different proportions for each project. These include, but are not limited to, abrasion resistance, provision of a non-slip finish, chemical resistance, delineation or a good standard decorative finish. For warehouses and light production areas we have liquid applied resin systems from 500 microns to 3mm giving good durability and slip resistance for light to medium traffic including trolleys and fork lifts. For long term durability under heavy load, slip resistance in wet service conditions and where frequent, heavy duty cleaning is normal we also have a range of trowel applied heavy duty resin screeds applied at up to 9mm. Rabbit Contracting specialises in epoxy and resin industrial flooring, floor coating and screeds for industrial, commercial and office refurbishment throughout the South East of the UK.